Sullivan County Manuscript Collection 0077. Hart family of Sullivan County, Tennessee. The collection was donated to the Archives and History Division, Sullivan County Department of Archives and Tourism in November 2009. Hart Family Collection. MSS 0077, Archives and History Division, Sullivan County Department of Archives and Tourism, Blountville, Tennessee. The Hart Family Collection is comprised largely of photographs from the family of David Jenkins Hart (1871-1956) and Martha Ellen Carmack (1873-1958) who owned Hart Dairy Farm in Holston Valley, Sullivan County, Tennessee. Photographs are dated early 1900s. Photograph of Martha Jane Hart (1901-2000). Photograph of Martha Jane Hart (1901-2000) and Ella Jo Hart (1904-1992). Photograph of Jacob Susong Carmack (1830-1904) and Elizabeth [Eliza] Jane Bushong (1838-1929). Photograph of Martha Jane Hart (1901-2000) and dog "Lady". Photograph of Ella Jo Hart, Sullivan College, 1925. Photograph of Billy Sunday on Hart Dairy Farm in Sullivan County. Photograph of Hart children and perhaps Pete Moore and others. Photograph of “Rosebud” cow from Hart Dairy Farm. Photograph of cattle on Hart Dairy Farm. [Barn or store shown in background.] Photo taken in 1922. 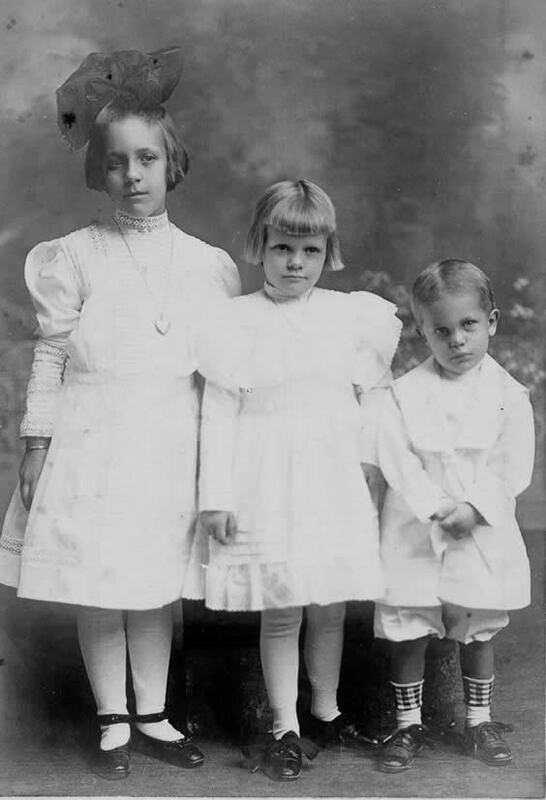 Photograph of Martha Jane Hart (1901-2000); Ella Jo Hart (1904-1992); and David J. Hart, Jr. (1906-1990). Photograph of Elliott family tombstone. Photograph of Hart family tombstone. Photograph of cattle on Hart Dairy Farm in Sullivan County. Photograph of unidentified young woman.